Since Hercules didn't work out too well this year for Dwayne Johnson, fans will have to look forward to 2015 for the action star to redeem himself. 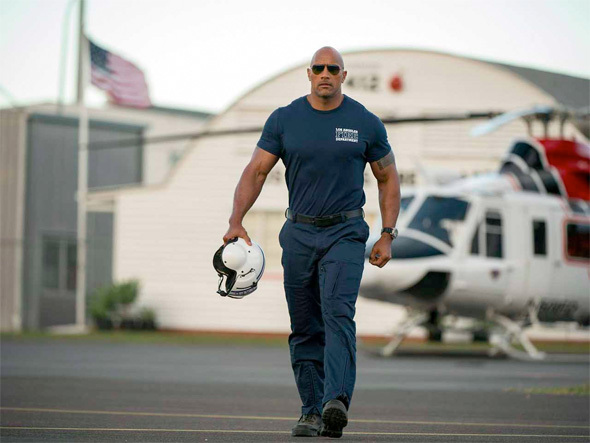 Furious 7 arrives in April, and then the month after, Johnson takes the lead in San Andreas. 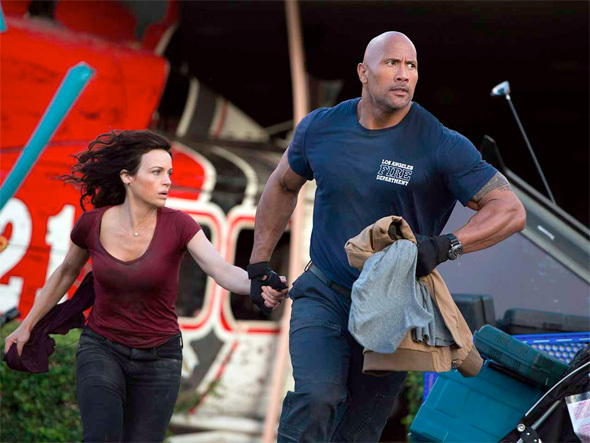 The action thriller from Journey 2: The Mysterious Island director Brad Peyton sees Johnson as a special ops firefighter working with his ex-wife (Carla Gugino) as they attempt to leave Los Angeles and head to San Francisco in order to rescue their daughter (Alexandra Daddario) after a massive earthquake strikes California. A trailer is coming soon, but first, here's some new photos. Check out our previous first look at Brad Peyton's San Andreas right here. This movie is apparently being scientifically advised by the director of the Southern California Earthquake Center, which should provide some degree of realism. We'll see. The last thing we need is more people afraid of earthquakes instead of prepared for them. Thanks for the post. Now I know what was the cause for the earthquake. Hollywood is definitely running out of ideas. It's like they took a piece from each disaster movie from the past (Volcano, 2012, Day After Tomorrow) and put them together to make this movie. Seriously, WTF?? Really, they took the concept of an earthquake from Movies, not that fact that California is built on a fault line. Or that there have been REAL LIFE earthquakes happening here for 1000s of years. NO your right, they took the idea from 2012. The context and plot have been done before. If you've watched other disaster movies, and then read this, you don't have to be a college professor (just have common sense) to know it's been before. They're going to throw in explosions, buildings falling down, people screaming and running for their lives and then The Rock will yell "run, run, run" like he's done in his other films....by the time the credits run everyone will swear Michael Bay directed it - which is not saying a lot. Wait, so are you saying that that this is the same Plot as other disaster movies, OR are you saying that they stole earthquakes from other disaster movies. Because your 2nd comment has nothing to do with the first one. I feel like ur just back pedaling now. Of course the same things gunna happen in this movie that happens in other disaster movies. The same things have been happening since the very first disaster movies, some crazy stuff happens, stuff gets destroyed. If you have a different way to write a disaster movie get out there and do it. But till you get off the internet comment boards and do it, im just gonna tell you, shut up and enjoy. So is he gonna get into a grudge match with the Earthquake? That'd be pretty cool. Gonna teach that earthquake a lesson so it doesnt bully the earth anymore? Wow! There anything The Rock can't do? The Rock has really let himself go. This dude signs on to any and every movie handed to him. You would think Dwayne would want to be remembered for the quality of his movies and not the quantity. Clearly The Rock doesnt care about quality. I mean, have you ever watched anything of his that was "quality"? Pffff i know i havent.